During his career with France, Jean Pierre Rives came to epitomise the team's spirit as a risk-taking and gloriously unpredictable outfit. A blond bombshell in the French back row, Rives overcame criticisms that he was too small to play international rugby with his ultra-committed, guts-and-glory style of play. Born in Toulouse, Rives first represented his hometown club in 1974. It was not long until his unmistakeable talent gained attention from the national selectors and Rives made his France debut against England in 1975, at the age of 22. It was the start of an international career that would take him to the very top in terms of both personal and team achievements. While Rives' long blond mane made him the most recognisable figure in the French side, he was also a part of one of the all time great back rows alongside Jean-Claude Skrela and Jean-Pierre Bastiat. As much as anything it was Rives' utter commitment to maintaining the French style of play that endeared him so much to fans the world over. Playing with a freedom and vigour that is all too uncommon in the modern game, Rives appeared at times to be in several places on the field at once. He was instrumental in helping France to the Grand Slam in 1977, an achievement that would have been repeated the following season had it not been for the decider being against the irresistible 1978 Wales team in Cardiff. Rives had been installed as French captain during that 1978 season, and it was in this guise that he would achieve perhaps his finest victory. 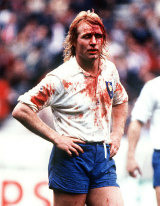 On Bastille Day, July 14, 1979, Rives and his France team faced down the might of the All Blacks at Eden Park, Auckland. A week earlier the French had been easily defeated 23-9 at Lancaster Park. It was a different story in Auckland, as the All Blacks came up against a French side imbued with the confidence to run the ball from every corner of the field. The All Black's defence was breached on four occasions as France triumphed 24-19 in an exhibition of Gallic flair. Rives continued to lead France with distinction, and brought a further Grand Slam in 1981 forllowing a 16-12 win over England at Twickenham. Rives would have his career ended by a succession of shoulder injuries in 1984. His final match for France came in that year's Five Nations defeat to Scotland at Murrayfield. Rives was going for a hat-trick of Grand Slams that day, but instead the glory went to the Scots. Following his retirement from rugby Rives chose to take a path less trodden by sportsmen, becoming a sculptor and artist. His sculptures have been exhibited in Barcelona, Milan and New York, and are featured at Les Fontaines international business centre in Chantilly. He has not lost all ties with the sport that brought him fame, however, and was instrumental in bringing the 2007 Rugby World Cup to France. Rives was part of the opening ceremony and also was a member of the presentation party, awarding the Webb Ellis Cup to John Smit and South Africa. One of his sculptures is now also a part of the French rugby calendar, after he was asked in 2007 to design the Giussepe Garibaldi Trophy. The trophy is awarded annually to the winner of the Six Nations match between France and Italy. While he is now a fixture of the French art scene, for many Jean-Pierre Rives will always be the hyper-competitive ball of fury at the base of the French scrum. A blood-stained hero, Rives remains an iconic presence to fans the world over.